Pig & Pony is pleased to present its fourth and final Austin exhibition, AnnieLaurie Erickson & Jessica Hans. Both Erickson and Hans look carefully at the world around us in order to re-present overlooked and invisible aspects of manmade and natural environments. AnnieLaurie Erickson’s photographic series Slow Light (2012-present) addresses the phenomenon of afterimages—the latent imagery that remains on our retinas after we look at the sun or at bright objects in the dark. Using handmade artificial retinas that register the remains of light, Erickson simulates an essentially unphotographable visual experience. 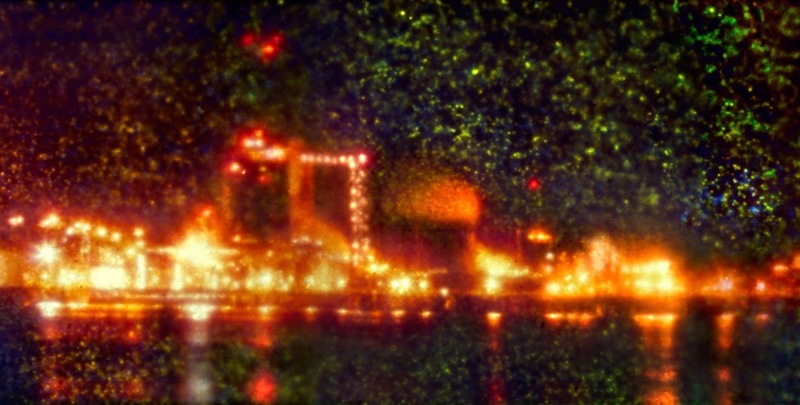 The subjects of these vestigial images are oil refineries sited on the Mississippi River. At night their appearance is otherworldly, they are always at a distance hovering above the variegated black horizon. The photographs mine the space between our immediate visual reality and the decaying, remembered imagery that subconsciously shapes our perception. Jessica Hans’ work is informed by her curiosity with inherent pattern and texture found in rocks and minerals. Her work references geologic time through human mediation. She is interested in the relationship between ceramics and geologic forms rendered through immense pressure and heat. Hans will often include foraged rocks and minerals as aggregate in her clay body and glazes. Her glazes sit on porous, neutral bodies akin to fresh molten lava or slime molds upon solidified surfaces, they often appear parasitic, leaching nutrients offered up by the raw fired clay.